An exceptionally exclusive and resplendent palace, Laxmi Niwas Palace is an awe-inspiring sight boasting memorizing architectural elements, including symmetrical layouts, ornate filigree work, and latticed screens. 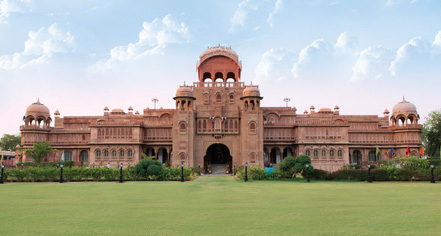 Situated in the heart of Bikaner, India, the stately palace was formerly the grand private residence of Maharajah Ganga Singh, where luminaries and notable dignitaries were lavishly entertained and inspired by the royal estate. Built in 1904, Laxmi Niwas Palace celebrates its magnificent Indo-Saracenic architectural design, featuring stunning interiors, including antique furniture, intricately carved poster beds, and delicate motifs. Boasting rich marble flooring throughout the estate, opulent sandstone, and treasured past, the palace creates a luxurious ambiance, enchanting honored guests of the past and present. The palace was built as the royal residence of Maharajah Sir Ganga Singh, whose strong sense of culture and style led him to carefully supervise the artists and masons throughout construction. Parking: Self-parking: Available; complimentary. Valet parking: Available; complimentary. RV, bus, and truck parking: Available; complimentary. An exceptionally exclusive and resplendent palace, Laxmi Niwas Palace is an awe-inspiring sight boasting memorizing architectural elements, including symmetrical layouts, ornate filigree work, and latticed screens. 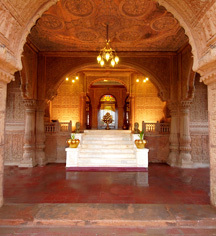 Learn more about the History of Laxmi Niwas Palace .